Hindus believe in the theory of "mahurats" or auspicious timings in every step in life - be it to begin a new venture or making an important purchase. Akshaya Tritiya is one such momentous occasion, which is considered one of the most auspicious days of the Vedic Calendar. It is believed, any meaningful activity started on this day would be fruitful. Akshaya Tritiya falls on the third day of the bright half of Vaishakhmonth (April-May), when the Sun and Moon are in exaltation; they are simultaneously at their peak of brightness, which happens only once every year. The word, "Akshaya" means one that never diminishes. Hence, starting a new activity or buying valuables on this day is considered to certainly bring luck and success. The religious merit that is acquired by giving gifts on this day becomes inexhaustible. Many buy new gold jewelry on this day. Most Jewel stores stock in new jewelry models for this occasion. "Lakshmi-inscribed" gold coins, diamond jewelery and golden dollars with the pictures of many gods and goddesses. Akshaya Tritiya, also known as "Akha Teej", is traditionally the birthday of Lord Parasurama, the sixth incarnation of Lord Vishnu. People conduct special Pujas on this day, bathe in holy rivers, make a charity, offer barley in a sacred fire, and worship Lord Ganesha & Devi Lakshmi on this day. The word "Akshaya" means imperishable or eternal - that which never diminishes. Initiations made or valuables bought on this day are considered to bring success or good fortune. Buying gold is a popular activity on Akshaya Tritiya, as it is the ultimate symbol of wealth and prosperity. Gold and silver bought and worn on this day signify never diminishing good fortune. Indians celebrate weddings, begin new business ventures, and even plan long journeys on this day. The day also marks the beginning of the "SatyaYug" or the Golden Age - the first of the four Yugas. In the "Puranas", the holy Hindu scriptures, there is a story that says that on this day of Akshay Tritiya Vedavyas along with Lord Ganesha started writing the great epic Mahabharata. 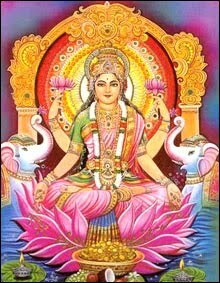 Ganga Devi or Mother Ganges also descended to earth on this day. Throughout India people celebrate weddings, plan new business ventures, long journeys and other events on this day. Like Diwali, Dussera and Gudi Padva, Akshava Tritiya is reserved for buying gold, silver and other assets. In India, gold is regarded as an ultimate symbol of wealth and prosperity. Traditionally this is the day when the farmers start ploughing the fields and plant seeds of grain. On this day people make donations, give alms and guru dakshina in the form of grain or money. Devotees perform Mahalaxmi Anushtaan, visit Mahalaxmi mandir and throw 4 kaudis in all 4 directions to attract wealth opportunities. It is also believed that people born during this time shine bright in life. Many luminaries were born during this period: Basaveshwara born on May 4, Ramanujacharya and Adi Shankaracharya on May 6, Swami Chinmayananda on May 8 and Lord Buddha on May 16. This puja has to be performed on this day only. The puja should commence in the morning and ends in the evening. From the next day onwards, one has to perform the puja regularly for 108 times by reciting the moola mantra. A photo of Goddess Lakshmi Devi along with Sudarsana Kubera Yantra could be used for the puja. Light with pure ghee should be used. Also light dhoop sticks with Kumkum and turmeric can be used.